They say that good things come in a pair, and many smartphone manufacturers in recent memory have rolled out a “mini” version of their flagship device, such as Samsung with their Samsung Galaxy S4 mini (although it remains to be seen whether the Galaxy S5 will feature a mini version) as well as the HTC One mini. Well, South Korean manufacturer, LG, wants in on the game as well, which is why they have introduced the LG G2 mini to the masses that might be small in stature, but big on performance. The LG G2 mini will feature a 4.7” display at 960 x 540 resolution, where a 2,440mAh battery will keep things running, at least for the entire day. Underneath the hood, you will be able to find a quad-core 1.2GHz Qualcomm MSM8926 (LTE) / MSM8226 (3G) processor, accompanied by a quad-core 1.7GHz NVIDIA Tegra 4i (LATAM LTE version) chipset, where there is 8GB of internal memory, 1GB RAM, an SD memory card slot for expansion purposes among others. As for its connectivity options, the LG G2 mini will support the Bluetooth 4.0 standard, where there will also be Wi-Fi (802.11 b/g/n), A-GPS, and NFC (4G LTE version only) capability thrown into the mix. Depending on your taste, you can choose from Titan Black, Lunar White, Red, and Gold shades, although do take into consideration that the availability of the colors depend on the particular region. It will run on the Android 4.4 KitKat operating system, where the entire chassis would measure a pocket-friendly 129.6mm x 66mm x 9.8mm. 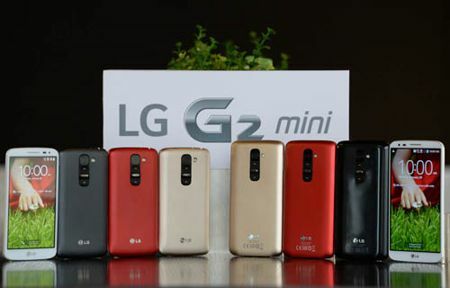 Expect the LG G2 mini to roll out globally this month with the 3G Dual SIM model in CIS countries, where it will be followed not too long after by major markets in the Middle East, Latin America and Asia, where among them include Singapore, Hong Kong and Taiwan, and Europe.